I finally finished my Mommes Lysedug lace scarf! Mind you, it took me almost an hour to do the bind off! Having done a lot of comparisons across circular shawls and doilies, I thought that it would use most of the 950 yards of the Oxblood colored Madeline Tosh superwash merino lace weight wool that I bought at Stitches East in Hartford last October. Yet, I had 1 1/2 ounces of yarn left after knitting the 111 pattern rows, one additional row of plain knitting and an elastic bind off. 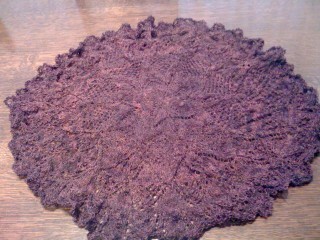 My lace doily/scarf measured about 22 inches across using a size 5 needle. Chart the pattern row by row since the pattern doesn’t use matching decreases. One member of Ravelry recommended this change for the flower at the center. If you like your lace knitting to be balanced, you’ll need the chart for this pattern. Once you write the chart out, then check that the decreases are balanced for the leaves embedded in the design. Count the number of stitches per section. This doily pattern consists of 10 sections. Within each section, the lace pattern may repeat. To minimize ripping out your work, I suggest counting the number of stitches per section. This way you are sure that your knitting is on track. Check the number of stitches per section after each row since it’s very easy to drop or add a YO. Counting ensures that your stitches are consistent and saves time trying to fix missed stitches. Add a last row of plain knitting (this would be row 112). Use an elastic bind off. If you knit tightly, I suggest going up a couple of sizes in needle. I used a knit 2 stitches, move these two stitches back to the left needle and knit them together. *Then knit another stitch, move these two stitches back to the left needle and knit them together. * Pull the yarn through the last stitch. Please note that this photograph is before soaking and blocking. It’s a fun knit once you get the hang of it and start to see the pattern building. For more information, please check out my earlier post.